Full immersion inside a Virtual Reality (VR) scene requires six Degrees of Freedom (6DoF) applications where the user is allowed to perform translational and rotational movements within the virtual space. The implementation of 6DoF applications is however still an open question. 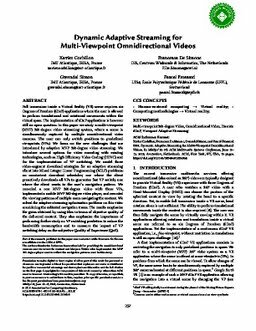 In this paper we study a multi-viewpoint (MVP) 360-degree video streaming system, where a scene is simultaneously captured by multiple omnidirectional video cameras. The user can only switch positions to predefined viewpoints (VPs). We focus on the new challenges that are introduced by adaptive MVP 360-degree video streaming. We introduce several options for video encoding with existing technologies, such as High Efficiency Video Coding (HEVC) and for the implementation of VP switching. We model three video-segment download strategies for an adaptive streaming client into Mixed Integer Linear Programming (MILP) problems: an omniscient download scheduler; one where the client proactively downloads all VPs to guarantee fast VP switch; one where the client reacts to the user's navigation pattern. We recorded a one MVP 360-degree video with three VPs, implemented a mobile MVP 360-degree video player, and recorded the viewing patterns of multiple users navigating the content. We solved the adaptive streaming optimization problems on this video considering the collected navigation traces. The results emphasize the gains obtained by using tiles in terms of objective quality of the delivered content. They also emphasize the importance of performing further study on VP switching prediction to reduce the bandwidth consumption and to measure the impact of VP switching delay on the subjective Quality of Experience (QoE).